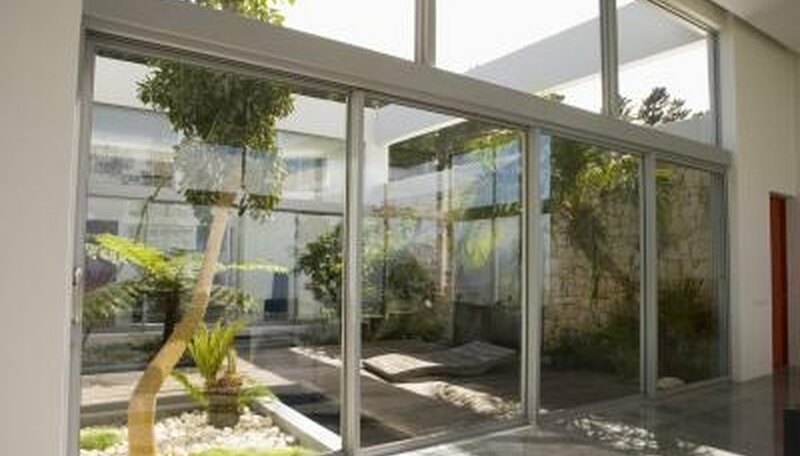 Whether it is a glass-enclosed space in your home or an encircled outdoor space outside your window, an atrium should be your oasis. When you enhance the natural lighting and open-air feel of the space with live plants, animals and a water element, you transform a blank canvas into valuable real estate in your home. Suited to quiet meditation as well as friendly gatherings, an atrium should reflect your personal style and passions with organic fundamentals. Green up the space by placing potted or planted vegetation around the margins of the space. Take the edges off the room by grouping plants in corners and mixing tall and short plants. Create a relaxation space in the middle of the room. Place a small table and chairs or lounge chairs in the atrium to make it more comfortable for guests. Add a water element to make the space feel refreshing and alive. Atrium spaces can tend to feel dry and hot if they receive direct sunlight, so a bubbling fountain or small koi pond will enhance the comfort of the room. Create drama in an outdoor atrium by investing in high-quality wind chimes. Long cylindrical brass tubes create deep, beautiful sounds and look great when lined up along the edge of the atrium. Bring the outdoors into an enclosed atrium when you place live finches in the room. Either place an extra-large vintage birdcage in the room or allow the birds to fly free for a more natural environment. Accessorize the space by placing some sculptural artwork amongst the plants or on a table. Add vintage architectural elements like old wrought iron fence pieces or an antique birdbath for more interest. Choose plants with the climate of the atrium in mind. Consider the amount of light and heat retention in the room before purchasing plants. Don't risk your pets. Talk to the pros when using live finches in your atrium. They may suggest a slow introduction to the space by starting the birds in a cage in the space so they are aware of food and water sources before releasing them in the enclosed atrium.